It seems like graduation just sneaks up on me every year. I mean...one day it's snowing 12 inches and then just a couple of weeks later...everyone is being all grown up and graduating and moving on to all the amazing things they are going to do with their lives. And then it's summer. And I'm terrified I'm going to wake up and it will be Halloween and my kids won't have any costumes so I'll have to run out to find something at the very last minute, only every thing good is already gone and when I look around everyone is staring at me with their judging eyes because I clearly don't love my children enough to plan ahead. So my children will end up wearing black fabric across their shoulders while pretending to fly around like bats. Again. Luckily, I always have enough chocolate on hand to sustain a small brigade of mothers and children for roughly a month...so at least I won't have to worry about the trick-or-treaters.... as long as I can find said candy under the pile of cookie cutters that I keep meaning to put away. Who has time for that?! If I only have time to make cookies or to put cutters away, you know which one I'm going to choose. It will be the one that ends with chocolate cookies and not a cleaner house. These diploma cookies are so quick to make that you might end up finding a few extra minutes to put cutters away...or do a little "internet research" for cutters that you don't already own. You know, in case you need them someday. 1. Did I say that these were super quick and easy? Because that might not have been strong enough words. 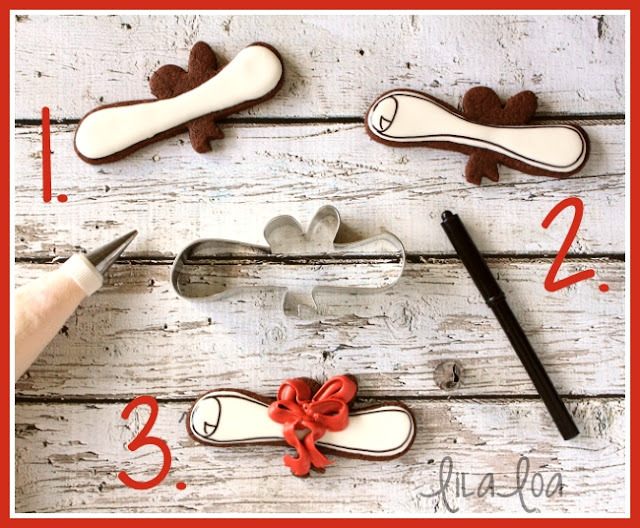 It's just 3 simple steps and 2 colors of icing. Outline and fill the diploma area of the cookie with medium consistency white icing and a #3 tip. Then let that cookie dry. For a while. Like...over night or 12 hours or half a day... your choice. 2. Grab a black food color marker and outline the diploma. You could also pipe the outline with thick black icing and a # 1.5 tip, but why make more icing? 3. Add a bow with thick red icing and a Wilton #97 flower tip. The rose tips would all work as well. Just don't use the tiny ones unless you want tiny bows. Keep the fat part of the tip down and it's as easy as drawing a bow. Pipe the top two loops first, then the middle two and end with the ribbon tails on the bottom.See? Easy Peasy! Grab the cutters here -- DIPLOMA, HIGHWAY ROAD SIGN (trimmed just a little), and STARS. 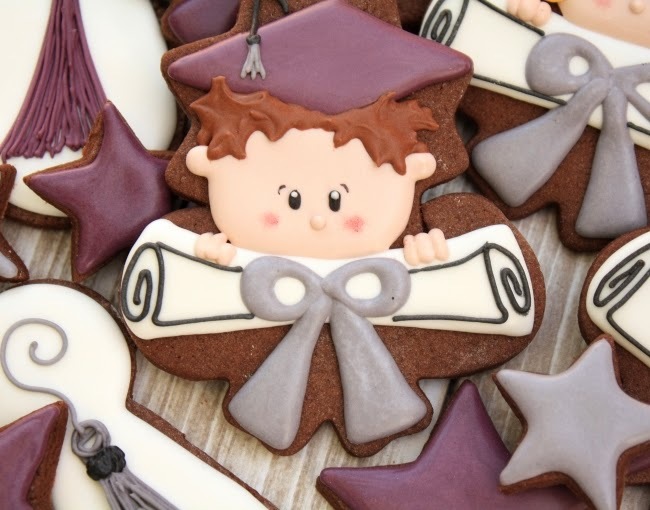 See how to make adorable little graduates with their diplomas HERE. 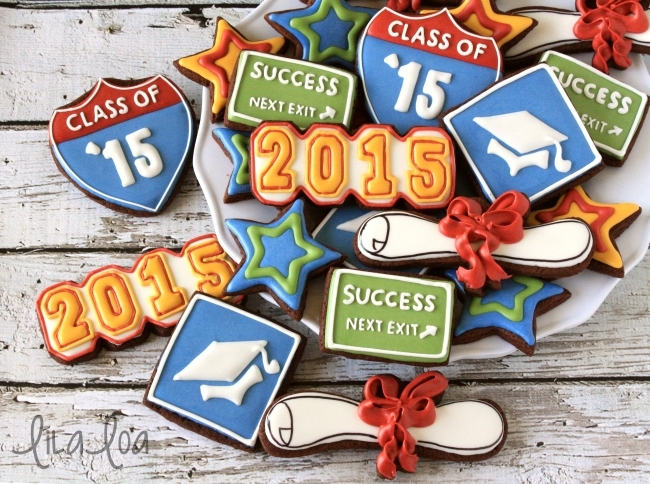 Discover Graduation Confetti Cookies with Callye at Sweet Sugarbelle.